Okay, not really. Today in Hey, We Haven't Had a Tebow Story in a While, What Kind of Blog Is This? 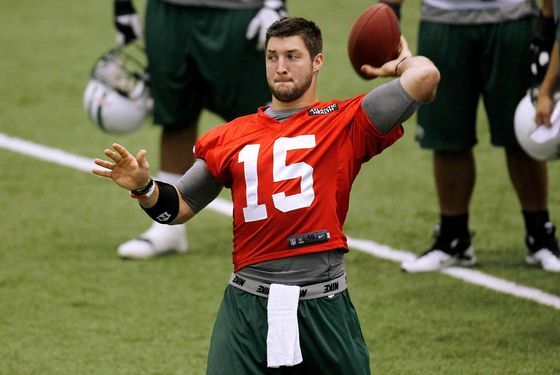 news: Tebow admitted yesterday that he has gained ten pounds since last season. It's totally good, though: The Jets asked him to do that so he'd have more power out of the wildcat formation. He's now 250 pounds of muscle; we presume he did not gain his weight through large, sugary beverages. This is further proof that the Jets have no intention of having Tebow as the primary quarterback over Mark Sanchez, not that anyone is going to believe them. (Witness this attempt to claim coach Rex Ryan said he would consider starting Tebow, for example.) But naw, Tim, have another donut, tubby.